We see the mistakes before the principals do. That’s what makes the news-story-gone-wrong drama “Truth” so compelling. The audience knows that the “60 Minutes” team investigating then-President George W. Bush’s shady service in the Air National Guard “doesn’t have it” even if they never realize it themselves. That doesn’t appear to be the intention of this drama, based on story-producer Mary Mapes’ memoir and her dogged assertion that “We got it right” in the face of a storm of criticism and a serious picking-apart of one element of that story. Cate Blanchett turns Mapes into a martyr here, a troubled woman and acclaimed journalist who fights “bullies” at every turn. That’s what she’s doing when she comes across the embittered, wheezing vet (Stacy Keach) who possesses faded photo-copies of military memos regarding Bush’s slack, politically-protected service and his alleged year spent “AWOL” (Absent without Leave), shirking even his combat-dodging rear echelon duties to work on Republican political campaigns in the early 1970s. Her source isn’t totally forthcoming about where he got these pages. She cannot create a “chain of ownership” to show where they originated, who had them at every stage of their existence. But she has other sources. She has an on-staff military expert (Dennis Quaid). She has document analysts who tell her they’re real. And she has some who express their doubts. Add that to the number of insiders denying the “truth” of the narrative she was pursuing. But in the mad rush to get a scoop on the air, those voices aren’t heard. It’s 2004, and as Mapes has considered tales of Bush’s connection to the Bin Laden family, not reported due to thin proof, and allegations that Bush was unfit to fly during his Air National Guard service because of his laziness and substance abuse problems, and as she’s promised her documents source (Keach) to put him in touch with John Kerry’s campaign, you can see the murky waters as they’re being navigated. “Agenda” is a label that leaps to mind. Writer-director James Vanderbilt takes us back to that politically charged era, with a president whose legitimacy much of the country questioned, possibly winning re-election despite letting 9/11 happen on his watch, thanks to billionaire-financed smear campaign TV commercials. Everybody has political motives — the right wing military men who curse Mapes for asking questions about “preferential treatment,” the cynical leftist reporter (Topher Grace) who was part of Mapes’ team. Everybody. Vanderbilt shows us a time-pressed reporting team, straining to get a story out far enough in front of the election so that they cannot be accused of an “October Surprise.” But their September story turns out to be just that. The story aired, the documents, which merely buttress the reporting, were instantly assailed by conservative Internet researchers. And that made the whole country– and the rest of the media — turn on Mapes and her on-air reporter, Dan Rather (Robert Redford). 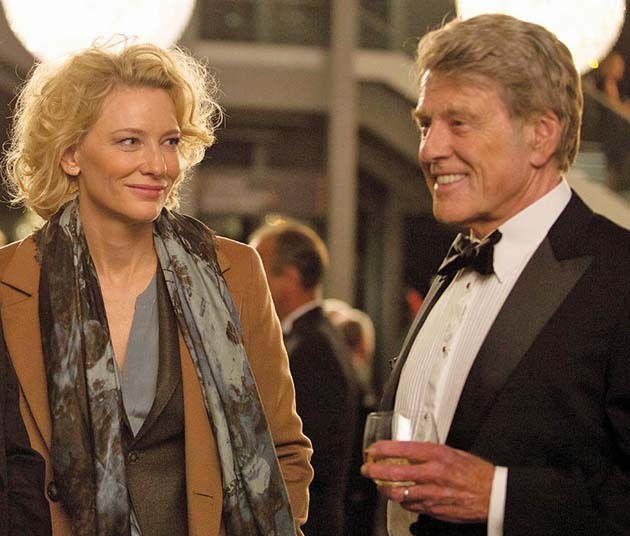 Redford gives Rather a sophisticated, self-aware sheen. He endures the ribbing over his folksy “Courage” sign-off, isn’t shy about saying “We don’t have it, yet” and comes off as the face and voice of integrity. Considering Rather’s tortured relationship with the Bush Dynasty — his bungles had a hand in two election outcomes — painting him as the victim here kind of grates. But the performance is self-assured, polished and wounded. The film touches on Mapes’ abused childhood, the reasons she does what she does with such determination. Like Rather, she was and is a decorated journalist, credited with the TV version of the breaking Abu Ghraib story. But we see the shortcuts, here, the holes in the story, as they appear — the edits that undercut her finished piece’s damning tone, the stumbles that even the Watergate reporters experienced as sources change their stories, after they air. It doesn’t matter that the “60 Minutes” team’s stated intent — proven clearly in the story — was that Bush the younger and his father used political connections to let him avoid serving in combat during the Vietnam War. It was old news, in any event — a mildly interesting counter-narrative to the widely discredited lies of the “Swiftboat Veterans for Truth” and their arch-conservative backers. The bigger AWOL story had holes. Screenwriter (“Zodiac, “White House Down”) turned director Vanderbilt leaves enough of the conclusions of “Truth” to us to keep it honest. Grace’s quasi-anarchist may scream about a corporate conspiracy — Bush White House, Viacom collusion. Their flawed story gave “them” the openings to discredit the reporting and the reporters. Jobs were lost, CBS News took a hard turn to the right (botched Benghazi stories and conservative anchor Scott Pelley followed). And another Bush got elected thanks to having “taken down” Dan Rather — all consequences of a TV story that needed to be bulletproof, and wasn’t. Cast: Cate Blanchett, Robert Redford, Dennis Quaid, Topher Grace, Stacy Keach, Bruce Greenwood. Credits: Written and directed by James Vanderbilt, based on the Mary Mapes book. A Sony Classics release. Pretty much the opposite of ‘All the President’s Men’. “Nobody reads newspapers.” My favorite line. “We’re ’60 Minutes,’ the gold standard.” My second favorite line.